Larry the Downing Street cat has landed himself in the proverbial "doghouse" - after a rat was spotted brazenly scurrying past No. 10's famous black door in London. Clearly feline lazy, what with the boss being away on business, Larry thought that nobody would notice his latest lapse in dispatching the rodent — only to discover it had been captured by a television film crew. Now as the chief mouser battles to save his job, he has taken to his own Twitter page to point the finger of blame at the real "dirty rat" behind this embarrassing episode. Nevertheless his career appears to be hanging by a whisker after the latest video, posted by BBC's political editor Laura Kuenssberg calls into question his performance and killer instinct. 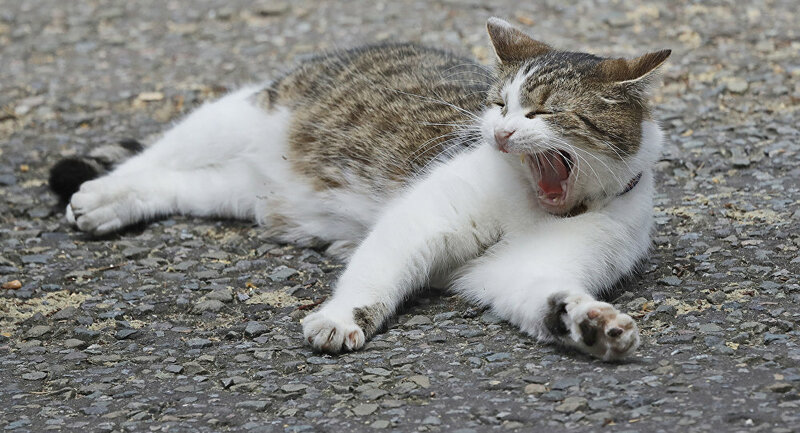 Number 10 insiders have hinted in the past that the moggie likes to snooze while on duty and allow mice and rats to scurry right under this nose. Pictures taken earlier this year showed him playing with a mouse outside the prime minister's residence before eventually allowing it to escape. In stark contrast, Palmerston, who resides in the Foreign Office, has proved to be the most lethal feline in Westminister. Figures released under the Freedom of Information Act showed that he had caught at least 27 mice since his arrival in Westminster in April 2016.